StartingBlock showcases Shaun Ritchie, CEO of TEEM, on what makes the Salt Lake City innovation ecosystem tick? Ever wonder how mid-sized cities break through to become entrepreneurial startup phenoms? Recently, StartingBlock hosted a lunch and learn with Salt Lake City entrepreneur, Shaun Ritchie, co-founder and CEO of Teem Technologies. Prior to co-founding teem, Ritchie ran a Inc. 500 company that was recognized not once, but twice as one of Utah’s Best Companies to Work For. He’s on Utah’s 2012 “40 Under 40” and a finalist in the Ernst & Young Entrepreneur of the Year program. In Salt Lake, he’s one of those awesome entrepreneurs who seem to know everyone and everything. For example, did you know that Salt Lake was the very first non-California node of the internet (Arpanet)? 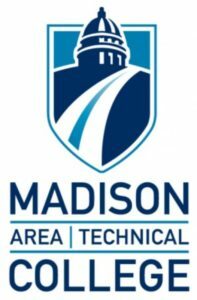 Ritchie and his team were in Madison working on getting the Teem platform up (hopefully) at StartingBlock and at the Spark building. We hope to showcase how Teem tools optimize how people, places and technology work together. More on that soon, so stay tuned. Always looking for great learning opportunities from outside the Madison area, we asked Ritchie about Salt Lake City’s transformation. Moderated by StartingBlock’s Entrepreneur-In-Residence, Scott Resnick, Ritchie shared how “next generation unicorns” like Facebook came to occupy former campuses of Sun Microsystems. He also told the the development story of Thanksgiving Point that now houses Adobe and a NSA data center. Interestingly, Ritchie pointed out some commonalities between Madison and Salt Lake. For example, Ritchie thinks of both Madison and Salt Lake as isthmuses. While Madison has a true isthmus between our lakes, Salt Lake’s “isthmus” is the constraint between the lake to the west and the mountains to the east. 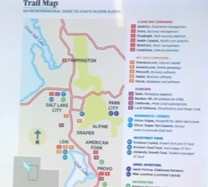 You can see from his Trail Map of the Salt Lake City Tech Community what he means. Check out with the vertical cluster of Cloud 100 companies (Qualtrics, Domo, Pluralsight, Health Catalyst, Waterfront, Inside Sales); Big Tech Companies (Overstock.com, Ancestry.com; Microsoft; Adobe and Oracle), startups (Teem, Bamboo HR, Chatbooks, and Lucid Software); nonprofits (Silicon Slopes) and investors (Sorenson Capital, Kickstart Seed Fund, University Growth Fund, Oakhouse Partners, and Levinthal Capital); and local universities (BYU and Univ. of Utah). 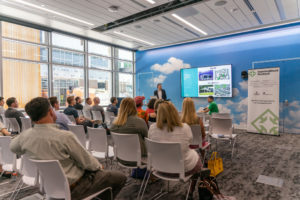 An aside: If you want to learn more about how Salt Lake City is making a play to become a player in cloud computing, check out the July 2017 Forbes’ article, How Utah’s ‘Silicon Slopes’ Became Cloud Computing’s New Capital. The article features how the CEOs of Domo, Qualtrics and Pluralsight pull all nighters together to build relationships and their work to diversify talent in Salt Lake City. Sound similar to the dinners and get togethers that take place regularly here by some of Madison successful startup founders? Also compare Ritchie’s Trail Map with a version of the Madison Innovation Ecosystem. Another similarity Ritchie noted is Provo and SLC a historically separate relationship, a bit like Madison and Milwaukee. While rival schools and cultural differences sit at the source of the Provo-SLC history, Ritchie pointed out that any differences take second place when it comes to promoting Utah as a state. Ritchie agrees that we would do better to stand together collectively as being Wisconsinites than to defend provincial historical divisions. He also agrees that mid-sized “twin star cities”–that is, cities close enough to each other to affect each other’s entrepreneur ecosystems and economies–should build stronger networks between them and regionally in order to attract investment capital and talent. On that note, kudos to those out there working hard to bring Madison and Milwaukee’s startup communities closer together. 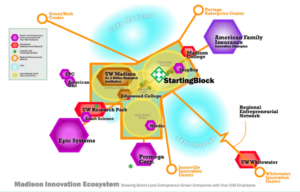 These efforts include StartingBlock and Milwaukee Institute’s Madwaukee Talks collaboration; gener8tor who has from the start been in both communities; and the Commons, a student innovation initiative that is expanding to Madison (they are also now at StartingBlock) from Milwaukee’s Ward 4; and others. Ritchie applauded Madison’s work on getting a nonstop SFO-MSN flight, stating that nonstop flights to the Bay Area is a “critical game changer.” In his experience, Silicon Valley has a “tribe-centric” mentality that results in very few investors willing to get on a plane to fly outside of the area. As a result, he found it easier to raise money from the New York and Chicago investment communities than Silicon Valley. Perhaps things are starting to change, but Ritchie thinks that it also makes startups outside of Silicon Valley think regionally, even internationally, earlier. In his view, startups outside of New York and Silicon Valley “hustle more” which makes them more stable in the long run and ultimately, more successful. According to Ritchie, a good indicator of momentum is when Bay Area vcs start investing in early stage companies in your area. Salt Lake is starting to see more early stage investors from the coasts, something we see happening here in Madison too. On the talent side, Ritchie talked about how important it is for cities and entrepreneurial ecosystem builders to create economies where top talent wants to be. It isn’t just about moving here for your dream job. It is about having future opportunities as well. In other words, helping talent with the question: “I can move to SLC (or Madison) for a great job, but then what? What happens after?” This resonates with GMCC President Zach Brandon who was in the audience. After all, the Chamber has done so much to put Madison on the map as the Next Big Thing (not to mention the SFO-MSN nonstop flight). Most importantly, Ritchie says that entrepreneurs must cultivate and develop an abundance versus a scarcity mentality. Successful entrepreneurs should have a “how can I help?” mentality as a core value. They should mentor generously, give back and share their experiences and networks for a true entrepreneurial ecosystem to flourish. Ritchie is a great example of abundance mentality thinking. We thank him for taking the time to share his experiences, viewpoints, and advice with the StartingBlock community and we can’t wait to showcase the teem platform at StartingBlock in the very near future. And if you want to get more involved in helping StartingBlock with its mentorship, entrepreneur-in-residence, and our programs, please contact Chandra@StartingBlockMadison.org or Scott@StartingBlockMadison.org..
Special Thanks to our LAUNCH Program Partner Madison College and to American Family Insurance for the pizza; and to DreamBank for letting us host the event in the great space on the first floor of the spark.